They frequently migrate in large flocks called “kettles” by hawkwatchers. Swainson’s Hawks are large buteos, similar in size to a Red-tailed Hawk, but with long tapered wings and long tails. Their wingtips extend just slightly beyond the tip of their tail when perched. There is a wide range of color morphs from very pale to very dark with an array of intermediate plumages. The sexes are similar but the females are larger. Light morph adults have flight feathers that are medium gray and contrast with the white underwing coverts. The wings have a two-toned appearance when viewed from below with the leading edge paler than the trailed edge. 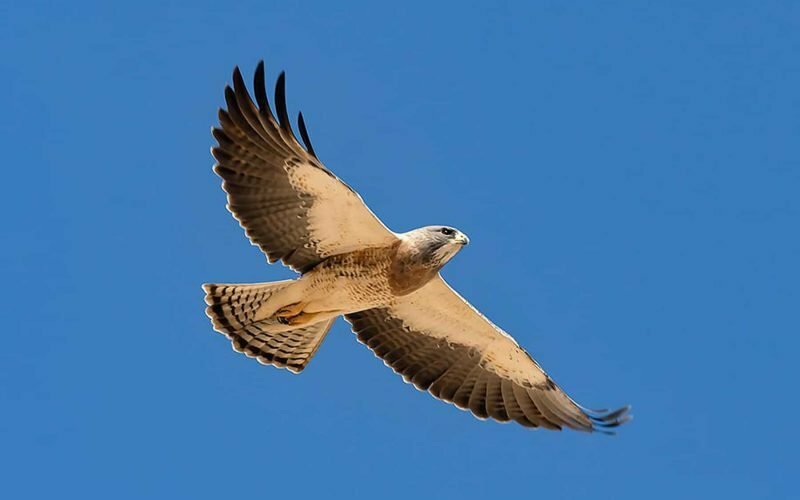 Swainson’s Hawks spend much of their time aloft and almost a third of their life migrating between the prairies of western North America and the ecologically similar pampas of Argentina. These regions are about 6000 miles apart and each migration takes about two months. Fall migration begins in late August and extends to late November. Beginning in late August in S.E. 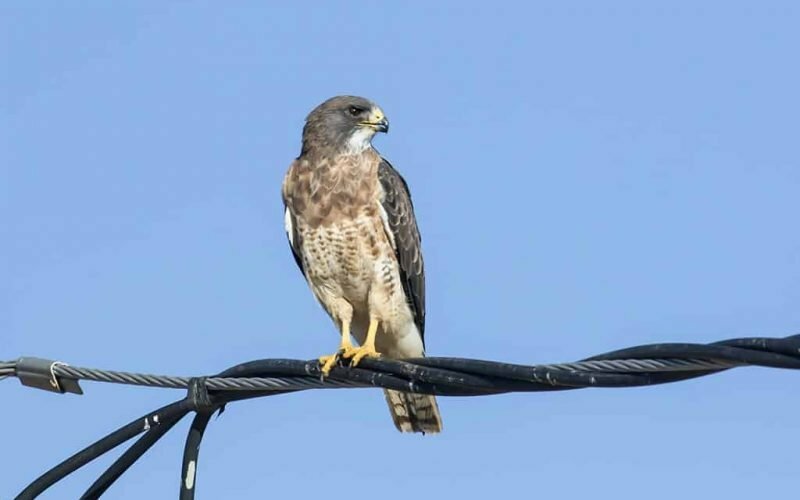 Arizona, Swainson’s Hawks gather in large flocks often in agricultural areas where they eat large numbers of grasshoppers to build up their fat reserves prior to their long journey south. They hunt both from a perch and from the air. I have often observed them running on the ground in pursuit of grasshoppers. Invertebrates comprise the bulk of the diet of breeding birds in order to supply adequate protein to the nestlings and fledglings. Insects, especially grasshoppers and crickets, dominate the winter diet. This species’ increased focus on agricultural land, mostly alfalfa and other hay, renders it vulnerable to the use of insecticides. 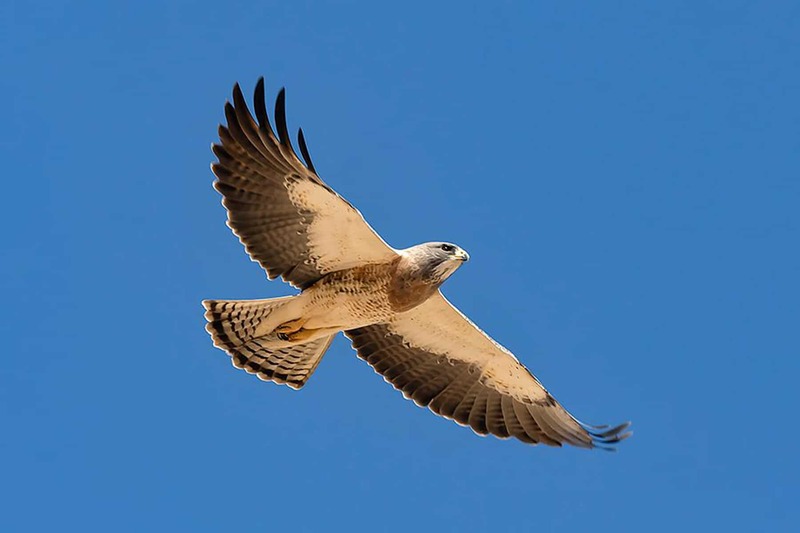 In 1995, in Argentina, nearly 6000 Swainson’s Hawks were killed when an organophosphate insecticide was used. Some birds were killed by direct exposure to the spray, others by ingesting poisoned grasshoppers. Argentina totally banned the use of this insecticide in March of 2000. Keep your eyes on the skies this month and you will likely be rewarded by views of these long distance migrants. They frequently migrate in large flocks called “kettles” by hawkwatchers. Consider a late September/early October visit to one of the local agricultural areas to observe them feeding on grasshoppers. My two favorite locations are the Sulphur Springs Valley and the Santa Cruz Flats. Ref: www.allaboutbirds.org: Birds of North America online.